To build a practical coilgun, we need to understand how velocity depends upon the starting position. How closely must the position be maintained to achieve optimum velocity? We tested with two projectiles: a 3.5-inch nail (the largest) and a 1.75-inch nail (almost the smallest). We assume that all other projectiles will behave similarly. The photo below illustrates how the starting position was measured. The 1.75” nail had a velocity plateau from 40.9 to 44.9 mm, a span of 4 mm. The peak speed was 17.3 m/s (57 fps). 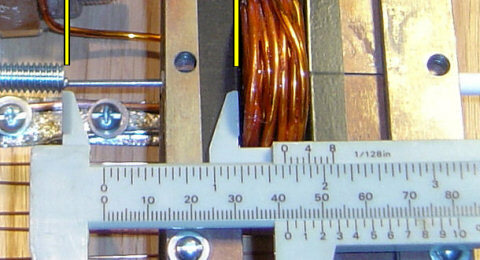 The 3” nail showed a velocity plateau from 81.1 to 85.5 mm, a span of 4.4 mm. The highest velocity was 12.7 m/s (42 fps). Within these spans of starting position, the velocity remained constant within 5%. The graph is surprisingly linear on the left. This corresponds to the projectile fully inserted into the coil. As the projectile is gradually backed out, the speeds increase. At some point, the graph reaches a plateau for about 4 mm, and then suddenly falls to zero. This occurs where the projectile is backed out far enough that the coil can no longer begin to pull the nail.